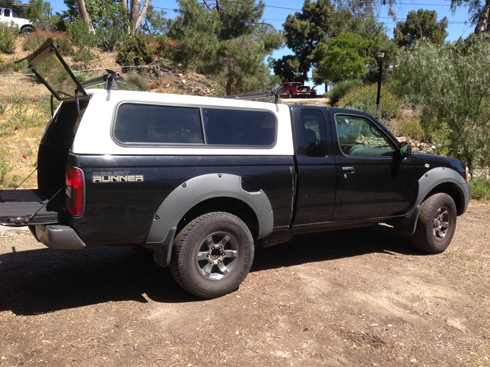 I’ve started a new project – I am turning my 2002 Nissan Frontier into a full fledged adventure mobile. This is one of those projects that has a clear starting point but won’t likely have an end. Perfect for more than a few innovation sessions. Though my truck isn’t yet an official adventure mobile, it’s life has hardly lacked adventure. I got it when I was 16. I’ve driven it across the country a few times so it’s been everywhere from San Diego to New Hampshire and to more national parks than most Boy Scouts. It has hauled dirt bikes, surfboards, camping gear, furniture and everything in between. It’s had a good life as far as trucks are concerned, but we’re just getting started. The goal of having an adventure mobile is simple – it should make it easy for our family & gear to get to places where we can have adventures. This involves a few sub-goals like keeping things organized, maximizing space and being versatile when things don’t go according to plan. We’ll further define & address them later on. The first thing I needed was an enclosed space to work with. Open truck beds are great for a number of things, but in the 10 years I’ve driven this truck, the number of times I really used the open bed is relatively low. Nonetheless, open beds are sometimes useful, so I decided to hold the shell down with clamps instead of bolts so that I can take it off if needed. The great part about a camper shell is that it offers secure, water-tight storage. It isn’t often a good idea to leave things in the back of an open truck bed. A camper shell solves a lot of this problem. Yes, a broken window still lets in a burglar, but that takes more effort than the casual opportunity theft of a surfboard left unattended in a truck bed. I bought this shell used off of an amateur gold prospector in San Diego. It even has a sticker from some gold prospecting association on the rear window that I intend to keep there. The shell had been sitting in his yard for a while so it needs a good cleaning and the rubber gasket will need to be replaced. It is in great shape though and made to fit my model. You might have noticed that my camper shell is white and my truck is black. This was by design. One of my main requirements was a cool place to keep things. Whether it be a cooler or a surfboard, I need to be able to store things in an environment where wax won’t melt and food will stay fresh. The shell roof is 5′ x 6′ and 30 square feet of black retains a lot of heat. White does a much better job keeping it cool. The next step was to make some space to store everything. Putting a plywood sheet in the back of a truck is pretty standard. I’ve read a lot about pros and cons of various ways to do it and I was inspired by a lot of cool designs. Particularly the Baja Taco. My needs are a bit different though so I’m going to design something original. In fact, after reading a lot about the pros and cons of a few different setups I think I’ve come up with a model that will give me the best of all worlds. I love it when those unicorn solutions are possible. To get started tonight I took a trip to the Home Depot. I love going to Home Depot. Well, I love any store that sells tools and supplies really. I always spend way to long in Home Depot though. Partly because I am usually tweaking my design in my head based on what I find in the store and partly because there are very few employees to help find things. Sometimes I consider shopping elsewhere but then I remember why I don’t. 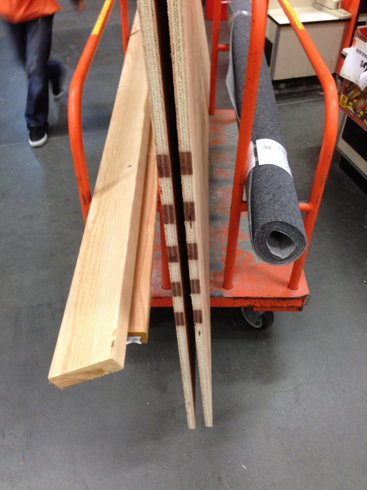 The list for tonight included some 3/4″ plywood sheets a few two-bys and some outdoor carpet. It took me a while to nail down the exact design, but I’m really happy with how it looks it my head right now. Unfortunately I spent too much time in Home Depot and ran out of time, so that is as far as we’re getting tonight. 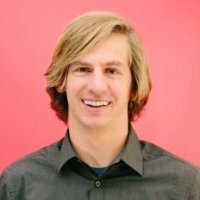 You can read the second post & see how I built the platform here.